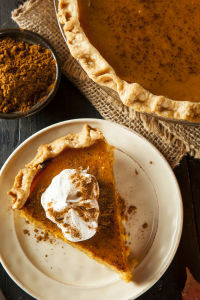 Tired of baking the same pumpkin pie? Well, here is something that would make you stand out at the next party. A light, delicious, sweet and crunchy pie that will blow your tastebuds out of this world! The recipe may seem a little too much work, but the rewards are just amazing. Trust me, you just can't make one pie. Rub the butter into the flour until crumbles are formed. Add the honey, salt, vanilla and milk to form a dough. Knead for 3 minutes. Roll it out and place into a greased pie dish. Mix the butter, brown sugar and pecan pieces and place onto the unbaked pie crust. Bake in the oven for 10 minutes. Cool. Bring the water to a boil. In a double boiler, place the sugar, gelatin, spices, yolks, pumpkin and milk into the pot and cook for 15 minutes. Chill this pumpkin mixture, whipping occasionally, till it starts to set. Beat the whites and sugar till stiff. Fold it into the chilled pumpkin mixture. Slowly pour this into the crust and set for 4 hours.